1. 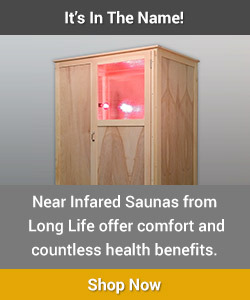 Leader in the Field- Long Life Saunas has been the leading near infrared sauna company since 2010. With products in more than 15 countries,we have more satisfied customers than any other near infrared sauna maker. 2. Safe, Effective Therapy- We strive to provide accurate, up to date science on infrared sauna therapy to help you sort through the volumes of information online and assist you in making the best choice for your needs. 3. Most innovative products in the industry. From our adjustable heat lamp arrangement to our radiant reflective sauna linings, Long Life Saunas has led the industry in innovation since 2010. That innovation has made us #1. 4. Customer Satisfaction- Our testimonials say it all. Customers love the effectiveness for their health conditions, the design for its functionality and attractiveness, and the durability of our saunas which are built to last a lifetime. 5. Handmade in the USA- All saunas are built to order. This gives your sauna personal attention. The result is a sauna that is built perfectly and packed securely. Quite simply, near infrared offers the most health benefits for the least cost. The main body of research on near infrared light therapy was done by NASA. NASA has no hidden agendas, no products to promote and no ties to corporate interests. They are one of the last places you can find genuine scientific research. As such, they are a resource you can trust. Here is a link to get you started. All Long Life Near Infrared Saunas are handmade and built to order, here in Maine. We proudly feature local and FSC certified wood in our saunas. Long Life Saunas has chosen to produce a highly effective healing sauna at an affordable price right here in the United States. As such, we can not produce them by the thousands. Instead, they are made one at a time with individual attention. And, unlike imported saunas, we can truly guarantee non-toxic quality. NASA research into near infrared has showed that this specific band of energy penetrates deeply into the body and has a very specific effect on the cells due to our body’s natural response to specific near infrared wavelengths. Inside the mitochondria of every cell are receptors that respond to these near infrared wavelengths. The light triggers an increase in cell metabolism, protein synthesis (including collagen), and anti-oxidant activity. It reduces inflammation and pain. Overall, the light triggers growth and regeneration of the cells. No other sauna offers this type of cellular effect. A near infrared sauna offers unique healing benefits from the near infrared light wavelengths that other saunas do not have. In addition, it is an inexpensive, readily available technology. You don’t need a $5,000 sauna to reap the health benefits. Only Near Infrared Saunas offer NASA-proven deep tissue penetration and cellular regeneration. Our saunas effectively deliver heat and specific cellular effects to create reliable therapeutic results.